This is an amazing house with probably the best view you can have of Los Angeles area. Indeed you almost have a 360 degrees view with on one side Los Angeles Downtown and on the other side the view of the ocean. This is a breathtaken place. Private Road, 4,000 square feet of living space, movie theatre, 3 master suites, and a lot of pieces of art. Safe, secure, and private, this very CHIC house will match all your expectations. This property features an incredible pool & spa area perfect for entertaining or relaxing with the family. Come enjoy the expansive views from the patio and bask in the sun at your very own private Beverly Hills Villa. New Home Theater in the house. Feels Like our Second Home! We have rented this property for two consecutive years now and will continue to do so whenever we visit LA. The House is really great, it is the absolute perfect vacation home for Los Angeles, it extremely quiet and peaceful, hidden away in Beverly hills away from the chaos of the city, yet it is within easy reach of everything you will need. The house has always been clean and tidy and it has a fantastic outdoor area with a great bbq and a fire pit.The owner is very friendly and accommodating and is always giving us excellent recommendations on the best places to go in and around LA. My clients/friends who live in NYC were planning a trip out to LA for the week after Christmas and they enlisted my help to find them the perfect vacation house for them. I found this on VRBO and immediately knew it would be perfect for them! The owners were very accommodating in letting me even come see the house before my clients decided on it, which was so nice and helpful. This house is absolutely perfect in every way - amenities, location, views, and owners. 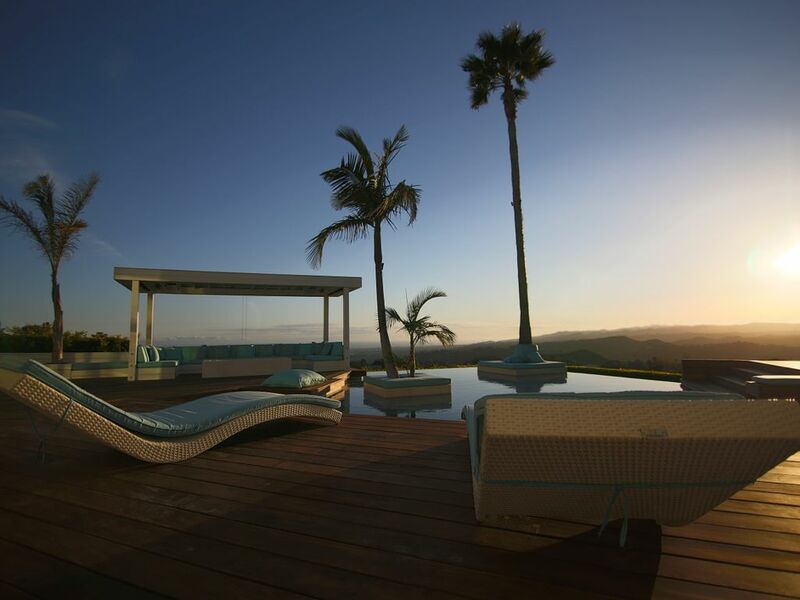 There is basically a 360 degree view from the location, whether you're out front and gazing all the way to downtown or laying by the pool in the back and you can see all the way to the ocean. We could even see fireworks going off the Santa Monica pier. The view of the sunsets can't be beat. The owners were there to greet us upon check in and make sure everything was set, and checked in during the stay to make sure there were no issues, they were so helpful and accommodating. The house is great for adults and families. My friends loved everything about the house and their stay and they will definitely be returning to stay again next time they come to LA - this is now their go to spot! I can't say enough good things about the house or about the owners!! Our family had an absolutely amazing time at the house during our two week stay. The house itself is truly spectacular. Very modern design and great layout. The views on both sides of the house are breath-taking. The amenities are impeccable - movie theatre, iPads to control the TVs and sound system, speakers outside, pool, spa, fire pit, grill! The kitchen is also very well stocked with everything you need. The house is really well taken care of. The house keepers were wonderful. The pool is regularly maintained. And the owners could not have been more helpful or hospitable. Anytime we had a question or needed help with something they were there. We went with our three small children (ages 5, 3 and 1) and wanted a house that was both child-friendly and great for adults. We could not have been happier. The house was very safe for kids and passed my wife's very thorough check list. There are even alarms on the doors that lead to the pool that alert you if your child heads out to the pool unaccompanied. The outdoor space is really beautifully designed. We spent nearly every day in the pool which is heated and the spa which has great booster jets. The cabana with fire pit was great for lounging during the day and at night. Our kids loved the movie theatre that has big comfortable reclining chairs and is complete with an old fashioned popcorn machine. I could not recommend this house more highly. Our kids have not stopped talking about the trip since we got back to NYC. We will definitely be back. This perfectly located home is like having a hilltop villa in Tuscany. The 360 degree views of the surrounding area were enchanting and peaceful. The home itself is clean, sophisticated and well thought out. Every amenity imaginable was available and easy to access. The owners met us for an orientation. Then they checked in occasionally (via email) to ensure all was well. The maid service was expert and efficient. I would highly recommend this property for a very special LA experience. And I look forward to returning again next year. enjoying the view from high above Beverly Hills. Since evenings were cooler we used the outside fire place frequently which was very comfortable.. Lots of athmosphere...!! The sound systems in the living room as well as the movie theatre are superb. This is very important to me. We brought our own CDs and IPODs, which worked great with the inbuilt sound system. Internet worked very well, too! The location is fantastic, just 10 minutes from the heart of Sunset Strip and 15 mins from Beverly Hills shopping precinct. The views are incredible with near 360 degree vistas from the Hollywood sign and Observatory(on a clear day)out the front to the Getty, coast and Ocean beyond from the private backyard. All in a tranquil private setting. The house is stylish and well designed and the rear entertaining area offers a fantastic pool, spa, deck and BBQ. The owners were very helpful and responsive. Highly recommended! 5 minutes from the very famous Sunset Trip, Sunset Boulevard with all its restaurants, concerts, bars, and stars. 15 minutes from Hollywood Boulevard.